Sight glass-window that allows the mechanic to see inside the system. This allows the installer or Servicer to observe the state of the refrigerant in the sight glass in place. 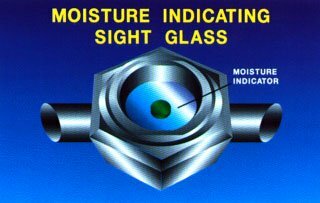 When moisture, pointing to the CD will include as shown here, it becomes moisture, pointing to the sight glass. 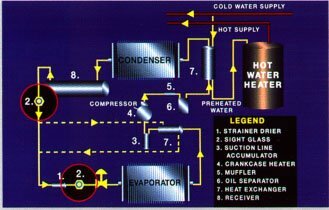 This mechanism allows the mechanic to determine the amount of moisture in the refrigerant circulating through the system. Chemical compounds on the drive sits in the refrigerant flow and change color in the presence of water. The amount of change indicates the amount of water. Each field rechargeable system must have a means to verify the sufficient amount of the refrigerant. Correctly located sight glass meets this need. It will not, however, tell you if the system is overcharged. Sight glass should have a viewing window on either side (dual port), so a flashlight may be shone through the refrigerant. In addition, sight glass should have a seal cap on every port to prevent leakage. Sight glass can be included in the original equipment. The split-systems and embedded systems, it must be installed as a refrigerant accessory. Correctly located sight glass is helping with the charging system. The usual location for sight glass on the liquid line as close as possible to the receiver outlet, or the condenser outlet, if the receiver is not used. In systems with liquid lines of moderate length, and a few accessories to cause the liquid line of the fall, more convenient location, you may be just upstream from the liquid metering device. In this place, sight glass has an additional function, which shows a pure liquid enters the metering device, as it should. When the pressure drop of the condenser (or AV receiver) with a metering device is substantial, additional sight glass must be installed capacitor (or receiver) at the output. The nearest evaporator indicates the pressure drop in liquid line.